When facing an issue with your InMotion Hosting account, including web pages, domains, files, and emails, sometimes you can feel lost. When contacting our Support Department, it is beneficial to make sure you have some basic information readily available as well as understanding the methods of contacting our support team. NOTE: InMotion Hosting is dedicated to providing our customers with world class Technical Support. Learn more about InMotion's Premier Support. There are numerous ways you can contact our Support Department for help with your account. We will now go over the available methods for getting support. When you initially need help, we recommend using the search bar at the top right corner of the support page. We have many tutorials online and they're updated often. If you are not finding a solution to your issue by searching our extensive base of articles and education channels, please feel free to submit a question on our support website. The Account Management Panel (AMP) now offers a "Support" page. 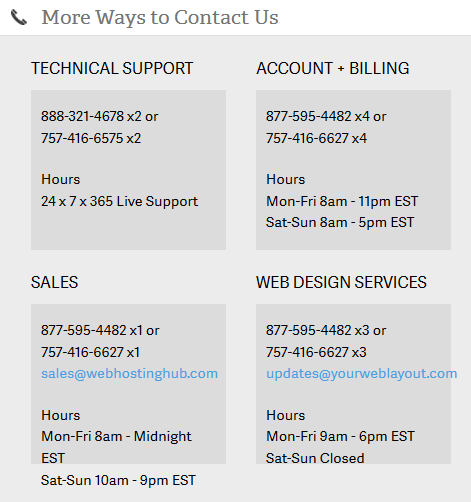 This screen offers a quick guide on how to obtain assistance through our billing, technical support, or sales teams. 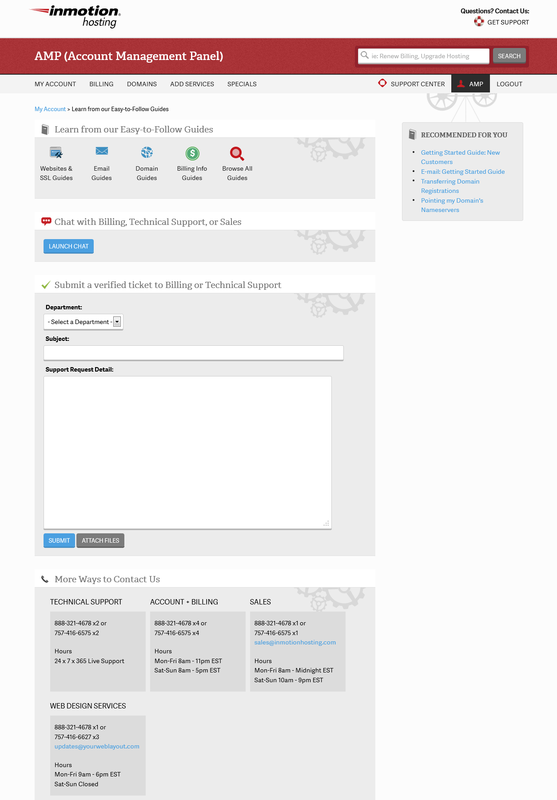 It also offers an interface to write a verified support ticket to either the Billing or Technical Support departments. The submitted ticket entry is tracked through email. You can also submit a ticket directly through your email client. To submit a ticket this way, send an email to: support@inmotionhosting.com Include a description of your problem, the version(s) of software/application involved, any error messages and steps to duplicate a specific issue. Make sure that you provide verification information for your account using either the last four digits of the credit card on your account or the Account Management Panel (AMP) password. Once you are logged into your AMP, click on Support in the top right hand corner. Then, you can select the Launch Chat button. A pop-up will appear. Simply, fill out the form and ensure you select Technical Support from the Please select the most appropriate department drop-down menu. Since the live chat initiated from within your authenticated AMP session, your account is automatically verified. Click the GET SUPPORT button on the top right. In the More Ways to Contact Us section you will see our contact phone numbers for: Technical Support, Account + Billing, Sales, and Web Design Services. To receive the best possible support, it is beneficial to have all the necessary information prior to contacting us. Account Verification such as your current AMP password, last four digits of the current credit card on file or the original cPanel password. Any error messages you are receiving. Steps we can take to replicate the problem. For more details on what information you will need to provide to your tech support agent, please see our article entitled Necessary information to know before contacting support. How can I transfer a domain name from one Inmotion account to another? How Do I Get More Help With My Support Ticket? When can I use hosting service? Can I use old version of cPanel File Manager? My new account is not yet activated, why? How Do I Receive My New Account Confirmation Email? I recommend checking out our guide on the 500 Internal Server error. It goes over the common causes and solutions to this problem. Unfortunately, I am unable to diagnose why your images are constantly being removed and replaced with the white box and blue question mark. What software are you using to build your website? Has the website been moved? Are the permissions on the server that you are hosting your website being adjusted unknowingly? Does anyone else have access to change these images? There are many reason this may be happening. If you are customer of InMotion Hosting, I recommend reaching out to live technical support for further assistance as the public forum is not a suitable alternative for help with your specific account. Good afternoon. I desperately need to know why I am unable to log into my webmail account. Its been just over a week and it always reads "We could not log you in. Please try again." I recommend contacting our Live Technical Support for assistance with your account specifically. Unfortunately, there are not enough details to diagnose the issue and that information may not be appropriate for the public forum. I bought a domain name from your website but Idid not received any email confirmation for this transaction - money already retreived from my account bank?? I'm sorry to see that you have not received the confirmation email. I recommend reaching out to our Support team for further assistance with your account. The section regarding "Launch Chat" is incorrect. I don't see this anywhere when I log into my AMP login, and would like to contact a rep through online text chat support since my ticket still hasn't been addressed regarding a recent scammer attack. Thanks for bringing this issue to our attention. I have edited the page to update how to get to the Launch Chat button. It's our pleasure. Let us know if you have any questions! Great! We're glad we could help, and we appreciate the feedback. Today, most of the hosting sites have technical support team. But your given info is very helpful for those people who want to contact with technical support. Thanks. You're welcome! Thanks for your feedback. Be sure to click the Yes button next to: "Did you find this article helpful?" This helps others in the community quickly locate the most helpful articles! Hi there,Can you tell me if and how it is possible to pay a new year of hosting per Paypal? Please contact our Customer Service team for assistance with making PayPal payments for any bill items on your account. They have the resources needed and will be able to advise further on the process. I am writing this text with due thanks for supporting to come up with a website. The aim of texting is as a result of my website collapsing from its servers (wordpress). I will be happy if you assist me get it back. We are happy to help you get your website back up but will need some additional information. What is the address of your website? Please I need my Authorization code to transfer my domain to another provider. My site is www.amditelizzi.com. Hello - please contact our live customer service team for assistance with your domain transfer. We cannot do that here in the Support Center website. You can see their contact information here. I am now using WP-500S Plan. Every time I update something in Wordpress and click "publish", it took quite much time for the website is actually get updated. May I know is there any settings that I can alleviate this time lag? It really depends on what is being updated, but if you enable debugging in WordPress it may provide more insight into what is occurring. You can change your cPanel password through cPanelor WHM (if you have access). If you are a customer of InMotion Hosting, you can use your Account Management Panel to change your cPanel password. My domain name is rvkinnandr****.com, I am having a problem with the reset password process. I recently updated my gmail accounts password and also I want to reset my password for my cpanel account. But when I am about to send a security code to my gmail account, nothing happens I can not receive any security codes on my email. This problem is taking me hours to solve and find what is wrong, i do not receive any error messages on the cpanel i just want to reset my password and that is all. Please reply as soon as you can, this is for my thesis. Thank you and have a good day. I can not send mails, I always get this message, what should I do? Here is a helpful link to our guide on 550 This message was classified as SPAM and may not be delivered. It provides detailed information and solutions to this error message. How do I "view" my support tickets?While I was writing my support ticket, I was half asleep. I think I hit submit (or may be I did not) but not too sure. Is there a link that I can click to see my submitted support tickets? Currently, support tickets are email based. If you sent anything through the ticket system, then it would have been replied to via email. Please review your email history for replies to the ticket. There is a ticket system in development, but we do not have an ETA on its completion at this time. i dont have the php.ini file in my root folder I need to change the settings please help me. If you are a hosting customer with InMotion Hosting, then it's really simple. Login to the cPanel, find the PHP configuration option. Click on UPDATE and a default php.ini file will be placed in the public_html folder. If you're not a customer, then you will need to speak with your host, or, if you know what changes need to be added, you can create a text file labeled "php.ini" and then place the text in the file. I hope that helps! If you have any further questions or comments, please let us know. actually, i have forgotten my password, then how can I overcome with that problem? help! We will need the last four digits of the credit card on file or the password. If you have forgotten the password, you may want to reset it. Sorry for the email issues. If you are having problems with email we would need more information concerning your account (if you're an InMotion customer), the specific steps you're taking so that we can try to duplicate the problem, and any error messages. We would also appreciate knowing what software you're using. You can also submit the issue to our live technical support team as per the article above. If you are going to provide the Support Center more information on your problem, please reference this page: Email Troubleshooting. Reply with a summary of your issues and the information to the applicable article. This helps to keep our comments sorted in the associated subjects. The support forum is open to the public and can be searched. If you wish to keep the matter private then please contact our live technical support team for immediate assistance. Please note that for any contact with our support team that we do ask that you verify the account for security purposes. I dont know my admin or password details how can i change them?? We would need more details about the application you're trying to access before we can try to provide more information. Please give us more details on the issue. Since this is just our public forums we cannot make any changes to your account from here. Please use one of the methods described above to contact our Live Support team, and they can copy the default php.ini file back to your account. You can then change your PHP settings. My company just got a new phone system. We have been experiencing some technical difficulties with it. I'm a little nervous that this is going to be a common issue. Unless however I can find help. It sounds like technical support deals with a lot of issues. Do they also deal with phone systems and networking? I apologize but no they only handle support for our products. Have you tried calling the telephone company or the phone manufacture. My goodness, the questions being asked in this comment thread are unbelievable. I am not certain how you guys can keep answering them without throwing something across the room. restart my vps. now it not connected. what problem? Sorry for the problem with your VPS. You will need to contact our live support team as per the article above for help with this request. We can't restart the server for you - especially with no information or verification about your account. Apologies that we can't perform the restart as requested. If you have any further questions or comments, please let us know. How to get full video sent by iphone to email. Thanks for the question about sending a video from your iphone to email. You can easily do this, but you first need to locate the video in the PHOTOS section where it is saved. Select the video, then click on the SHARE icon and you will have the option to send the video to an email address. I hope that helps to answer your question. In the future, to help us keep these questions organized, please use the questions option, or place the question under an appropriate category (such as "emails"). If you have any further questions or comments, please let us know. If you're on a shared server, then you may not be able to change that setting. It requires root access (normally available only on VPS or dedicated servers). You have edit the MySQL configuration file in order to make that change. If you are an InMotion Hosting customer and you don't have root access on either VPS or Dedicated, then you submit a verified support ticket with the request. Another thing to check: I use a VPN quite a bit and found that, when I was connected to it, I could receive but not send mail. You might want to add this to your troubleshooting steps. How are you trying to send the emails? Via an email client or using the web email client? I am using Outlook 2013. As sson as I disconnected from the VPN and clicked Send/Receive, everything went out. If you are able to send via webmail via VPN and not through Outlook, it would not be a server issue, but something between the email client and the VPN. Give webmail a test to see how it behaves. I would suggest either calling our support team or visit them within a chat to find the status of your account as it may still need to be confirmed by our on boarding team. [Zend]zend_extension="/etc/opt/php_extensions/ZendOptimizer.so"wehere ZendOptimizer.so is at this path. I use php v 5.3.10 and there is not information about the oprimizer in phpinfo. Does it work with php > 5.2 ? Zend is enabled on all servers by default, however, your php.ini may be looking for an incorrect path. You may simply comment out this line in your php.ini file in which the server will then use the default installed location. Sorry to hear that you forgot your password. Unfortunately, we can't reset that for you here in the Support Center as it requires some security screening to protect our customer accounts. Please contact our live technical support team as per the article above. If you are not the account owner, then you will need to contact that individual for assistance. Support verifies accounts using either the credit card on the account, or the Account Management Panel (AMP) password. Unfortunately accounts cannot be cancelled here because of the need for personal verification information. You will want to use the information above to contact the Live Support team to perform the cancellation for you. I am a minister and for several reason I won't get into. I must close my account immediately! INMOTION HOSTING IS THE BEST I EVER HAD!!!! Hopefully you don't need anything else! Thank You for you respect in honoring my request ASAP! Can you please stop the auto renew of my account, due circumstances i'm not more able to keep a site online. Thank you for your request. This is just our public forum, please create a ticket via AMP for this type of request. Since it is extremely insecure to post your account information in a public forum, I have marked out your account specific information. If you have any further question, please post them below. I cant publish my site mongcoal.com as i get error :cannot conect to the host FTP. First, double check FTP settings in cPanel to make sure there is not a typo. Next, make sure your hostname is pointed to InMotion Hosting's servers. Remember, any DNS changes can take up to 24 hours to propagate. If you are still not able to connect, perform a Ping & Tracert to your hostname. This will help determine where your connection is going or stopping. i have been using the email since a year+ which was supported by one of the web developer. But now since 3 weeks unable to login and access the email. Can you please assist to resolve the issue. I am happy to help. Could you provide more information about the issue such as the errors that you are receiving as well as the mail client that you are using? Login : Error as I"ncorrect Password"
present I receive through forward option which was setup earlier.. So Iam unable to respond to reply any clients. If you could assist to reset the password and confirm admin login.. It will be helpful.. The person who supported to develop Teh web and create email access is not reachable..
Judging by the error, it seems that you simply have an incorrect password. Have you attempted to change it and use the new password? It also appears that this website is not hosted with us so there could be another issue there as well. You may need to contact the hosting provider for more exact information. Actually it's not password issue, because never change recently and also those set-up done earlier suddenly prompted with this message.. Anyway, thanks for your great support. Is there any way I can change web hosting from you. What will be your hosting charges and issues if I decide to migrate from other hosting. Pricing and plans may be found through our main site at inmotionhosting.com. Actually, i have troubles with Magento 1.8.0.0. When i put a simple php file that prints a simple hello world in my magento's local model folder of controllers, i cannot access it through that path. Lat's say i my file is here: localhost/magento/app/code/local/CompanyName/ModuleName/Model/Hello.php. When i try to access thi file through my browser, i get the 403 forbidden error, saying that i have no permission to access that file at that server. i input it like this: http://localhost/magento/index.php/ModuleName/Hello.php. May you help me? Thank you so much. Sorry for the problem. We do not mind providing assistance for your queries, but we sincerely appreciate you placing your question in the section for Magento, or submit it as a question. This insures that other visitors who see the same issue can find it and help provide specific information sorted into a related area. As for your path - you will not be able to access the file that away because of your URL. You will need to use the URL that you use to access Magento. For example, if you access magento at http ://example.com/magento, then the path to access your file would be http:// example.com/phpfilename. This assumes that you put the file at the root of the Magento installation. If you did not place the file at the root, then you would need to include the sub-directories within the path. So, based on your example it would look something like: http:// example.com/ModuleName/Hello.php. The index.php would not be part of the path as it's a FILE as opposed to a folder. Also, the "localhost" reference generally means the computer that you are using (as opposed to the hosting server). The path reference should reflect where your installation is located. If you're trying to access it via the internet, then it should be set your website URL. You should only use the localhost path if you're on the computer where you have installed Magento. I hope that helps to clarify the path problem! Let us know if you require any further assistance. I'm very disappoointed with this company. This is not what I wanted and I've repeatedly asked for a refund and all I get are more emails asking me if I'm sure I want to cancel. YES!! I want to cancel!! I just wish someone would do it! I am sorry to hear you are having issues with cancelling. It is typical to get a confirmation email, but you should not get more than one unless you sent in separate requests to cancel. Simply responding to one of those confirmation requests should be enough to finalize your cancellation. Please let us know if you have any further issues after confirming. It appears that your code is looking for an absolute path to a file that does not exist. Check to ensure that your paths are correct. I used to recommend inmotion. Inmotion used to provide great customer support. Now it is a joke. A bad joke. Waiting hours in queues. Being told incorrect info. The ticketing system is crap and needs a different login which they don't give you. Customer care is woeful. They have maybe one person on their tech team who is knowledgeable and helpful. 24.7 ? No. And I'm running a virtual private server with these guys. It's not cheap. It's not a cheap low cost hosting option. It's not about the money. It's the lack of support when you need it that I can not tolerate. I'm moving. I apologize if there was some delays and confusion with your VPS account. It looks like you had inquired via support ticket if the VPS came with a separate IP address from the shared IP, and then requested to have your account migrated to another hosting provider. It seems the majority of the confusion came at this point after your new host had issues getting a backup, and then it looked like our support team provided you steps on creating a backup of your account, instead of actually proceeding with generating the backup from our end. I apologize for that oversight, and the additional delays you encountered from having to wait for a rather large cPanel account backup. This process unfortunately is very slow after an account is around 4GB in size., and it looks like yours was around 11GB. I see that our support team was able to speed up the full backup of your account by splitting up the data into smaller chunks, and that should allow your new hosting provider to restore everything for you. Sorry for the way that things were handled. I see that on 8/20 your account was hacked and we quarantined some files for you that were sending out spam. So please be sure you're using a strong password at your new hosting provider, and updating all your software. That should hopefully stop further intrusions which might have led to some of your issues such as IP blacklisting which could make your emails bounce. Sorry for the trouble with the login. It appears there was an issue with the our chat system when you contacted us or the connections was not working to us from your location. Make sure if you are an international customer, to use our International number. You can try using the password reset button. See the following links on this. Unfortunatly, the information your provided does not have enough information for us to look up your account. If you could give your domain we could investigate further. Cannot log into support center to view a reply to my request. User name not found. When I log into the regular site, the user name (only one I know of) shows correctly???? Unfortunately it looks like there was an issue creating your account that allows you access to submit and view tickets online. I would recommend either starting up a live chat from our website, or submitting a support request directly via e-mail to (support@inmotionhosting.com) relaying this information and our support team should be able to have that account created for you, so that you can view the status of future tickets that you submit. Help. I am being spammed to death... about 1 a minute. What can I do to stop this. Thanks for posting your comment. I'm more than happy to assist you. I've looked over your account and noticed you're running WordPress. There's plenty of plugins to help you fight Spam within WordPress. I'd start by configuring Aksimet which is included in your default installation. I just signed up yesterday and have just realized there is a business already with the name horizon photographic's. Even though they don't have a website I don't want to be associated with them. I have purchased a new domain name through you guys and would like to know if you could please appoint my new domain as my primary domain? Please follow the steps in the article and a support representative will handle your request in the order in which it was received. thanks for posting. However, I had to remove your comment with your account information in it. This is a public forum where everyone can see the information. With that in mind, you should make sure that your password is changed immediately. Also, I will not be able to make those changes for you as you will need to contact our support department. You can do this by phone or email.